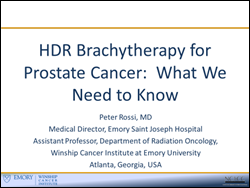 Dr Peter Rossi, Medical Director at Emory Saint Joseph Hospital, prepared a very comprehensive overview on HDR brachytherapy for prostate cancer, including history and rationale, technique, effectiveness, toxicity and costs. Initially targeted to urologist, this presentation is interesting to anyone who wants to learn more about the treatment. Dr Rossi kindly agreed to share his presentation via the BrachyAcademy, so people can use it for education and learn from it The presentation is available in the e-Library, and only available when logged in.